Some grand jurisdictions have the formal role of Immediate Past Master (IPM), who serves as an advisor to the master. This allows the master to get good guidance from someone who just went through everything, as well as allowing the IPM to transition back into the role of a regular lodge member. Alas, Virginia, where I live, is one of the grand jurisdictions that does not have this role, but it is a pretty good idea for lodges everywhere to institute this function for mentorship purposes, even if it is not officially defined by the grand lodge. I knew from experience that once you became a past master, you somehow became an expert in Masonic ritual and were qualified to have ritualistic outbursts to correct anyone’s wrong words at any time. I always found this humorous. The men who, just a year or two earlier, could not string the words together the right way, suddenly were experts. I am not claiming to have done differently after retiring from the East. I know I had such outbursts, even though I had told myself I would resist the temptation. In all seriousness, though, the past master has some important duties. First and foremost, the past master’s job is to be involved but stay out of the way. Advise the master and officers but refrain from instructing them on what to do. Be a leader among the members but refer them to the master for answers and defer to his decisions in all instances. Be a wise and trusty advisor but also be prepared to be ignored after issuing forth what you think is wise advice. Observe. Listen. Whisper good counsel. 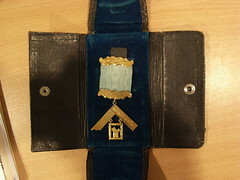 Past Master’s Jewel by Paul Jerry, on Flickr.